An accent wall – a wall painted a different color than the other walls of the room – is an easy and effective way to not only liven up the space but also (depending on the color you choose) to fool the eye into seeing the room as a different size than it is. When it comes to choosing the right wall to highlight as an accent wall and the best color to paint it, it helps to consider the room’s exposure, along with basic color theory. Here are some great tips and advice to help you decide which wall to accentuate in your bedroom, and the best color to paint it. Warm colors—orange, yellow, and red—tend to pull the wall towards the eye, which makes a space appear smaller. If you decide to use a warm color on your accent wall, choose a wall that can handle being foreshortened. 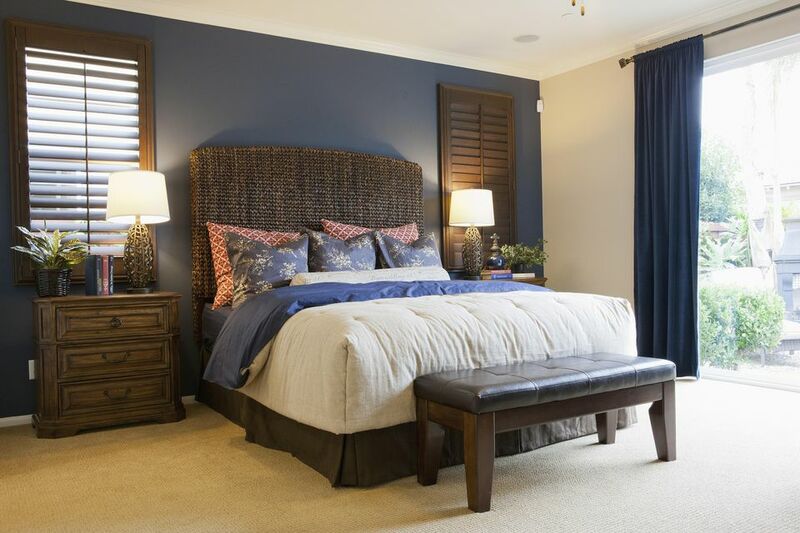 A good place to use a warm accent wall is in a long, narrow bedroom. By painting an end wall, it will create a more balanced space. Cool colors—green, blue, and purple—tend to pull the wall away from the eye, which makes a small bedroom appear larger. By using a cool color on an end wall or side wall in a bedroom, you can make a small room appear larger, or make a skinny room appear wider. Another option is using your ceiling as your accent wall; paint a low ceiling a cool color to give the impression that the ceiling is higher than it is. Another consideration in choosing the perfect accent wall and color for your bedroom is to determine the visual temperature of the room. This doesn't mean the actual air temperature of your bedroom, but instead, the psychological effect of the room's natural light and chosen palette. If you do not know if your room seems to be too cold or warm, then consider these easy guidelines. Eastern or Northern Facing Bedrooms – A bedroom that is facing north or east tends to feel and appear cooler; therefore a warm hue will add warmth to the room. Western or Southern Facing Bedrooms – A bedroom that is facing south or west tends to feel and appear warmer; therefore a cool hue will visually lower the temperature in the room. The best accent wall is the wall that stands out in the bedroom. It’s the wall you are drawn to when you enter the room. Most often, this will be the wall at the head of your bed. However, if you want to use a different wall, or if you are unable to determine which wall stands out in your bedroom, ask a friend or family member to walk into the bedroom and let you know which wall seems to draw their attention. The wall they choose will be your accent wall. To create a well-balanced design, it’s important to plan your furniture placement around your accent wall. Most of the time, your headboard will be against the accent wall, but if not, be careful to avoid obscuring your accent wall with a large object, such as ceiling-to-floor drapes, windows, or an enormous wardrobe. If the wall is covered, then you will lose its dramatic impact. Finally, make sure not to leave an accent wall too bare, or you’ll have too much of a “pop,” and the room will feel unbalanced. Now that you’ve determined which wall is your accent wall and color, it’s time to decide on your accent wall finish and other decorating accent colors.